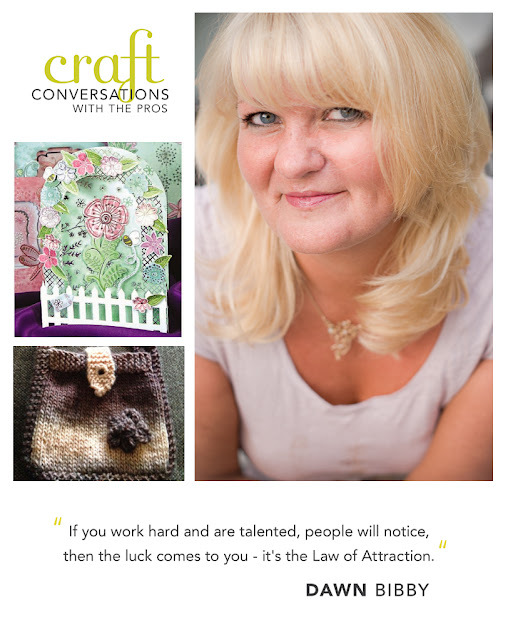 Who else should start the Craft Conversations with the Pros series but someone that every paper crafter in the UK will know: Dawn Bibby! Since 2007, I have been quite close to her both professionally and personally, so I have seen her in many situations that people can only guess. 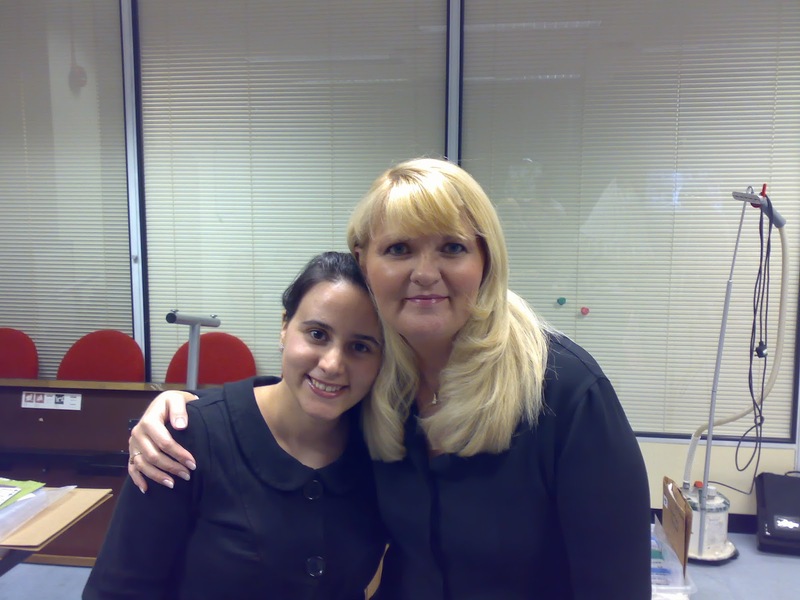 I consider dawn a close friend and one of the few people who actually has gone out of her way to help me. 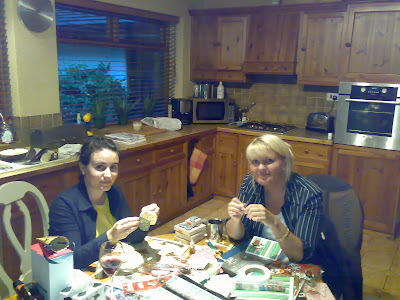 August 2007, in her house making samples together. Without further ado, here you have her story. Dawn, when and how did you start in the craft industry? Well I guess I started as a child drawing images and making cards but I really started making and selling cards when I was about 23 (25 years ago) when I was doing craft fayres and shows. I began making cards and selling them which then led me into selling the supplies for people to sell their own. I then couldn't find all I wanted so started designing and working with companies to produce them. It was whilst at a show a lady said she thought my demonstration was very good and had I thought of selling on TV ? She gave me a contact and QVC and well the rest is history I guess! I was the first person in the UK to take rubber stamping and paper crafting on to TV. And it was a battle believe me ... The buyers couldn't understand why anyone would be interested in pieces of paper and rubber stamps. And they down right refused to buy sticky dots for at least a year!! After a while, I became disenchanted with my role and in particular the pay, so I decided to go for a higher pay working in a compact disc factory - Phillips and DuPont. I was still designing and selling and ran party plan through family and friends. I then took 18 months out and became an au pair in Switzerland. I ended up designing for a boutiques in Zurich and doing private orders there too. At the age of 21 I came home and set up my first proper business (with the help of my beloved mum) on the enterprise allowance scheme. I built my stock and started supplying stores and attending shows. I soon saw the potential for supplying product rather than finished items and set up a little mail order company - Topaz Crafts. Armed with finished garments and cards plus the fabric paints, glitters and stamps I toured the UK attending shows and selling. Hence my meeting the lady whom gave me the contact number for QVC. Well my career developed more into creating TV shows and selecting product for them. Still designing but building a team of people to execute those shows, which included product selection, formatting kits, creating finished samples, planning the shows and then executing the live show on TV. Approximately, 4 years ago I joined Create and Craft where I became more of a craft expert presenter. Take more time to live and not be as career focused. Also listen to my head more than my heart. One should always follow your gut instinct and, sometimes, I did not! For me, working in this industry is a passion and a lifestyle choice. There are never enough hours in the day to do everything or create everything. If you are dedicated and passionate it's a wonderful industry to be in. However I don't think we ever really get paid for the time and effort put into projects or work and to many people they cannot see value in the time spent creating. After all, it's just a card! Or just a handmade item, why should we be paid an hourly rate for a knitted jumper that took 72 hours to make? Get my drift? Or even £5 for a card that maybe took an hour and a half to make. But we do it with love and passion and, nowadays, more people are respecting "handmade" and thankfully valuing it more. I think my proudest moment was the very first time QVC ran an advert with my profile and name in it! I was so excited to be given that opportunity and rang my mum screaming down the phone Mum was my biggest fan and without her I could not have achieved any of this. Creative talent gives you the passion to succeed, but then you have to put the hard work behind it. If you work hard and are talented, people will notice then the luck comes to you - it's the Law of Attraction. My favourite projects constantly change - right now I'm loving knitting and making bracelets. Favourite colour pink but I don't always use it in my creations. I'm quite into turquoise at the moment. Inspiration is all around me - nature is the best! and also, fashion. The colours and trends are always to be watched as they translate into every area of our lives. What is next for me on this incredible journey ? Well now that would be telling.... I'm currently on a well earned break and busy designing and creating and will soon be setting up a Facebook page selling some of my handmade creations. But I will be back working in the industry from September! so you must keep your eye on my official Facebook page and Twitter. I am very excited to be working with people who are not just brilliant and talented people, but some of them are also very old and dear friends. When we first met Paula - I think it was in Amsterdam on a craft event. I thought you were lovely , a little bit flustered but so full of fun and love for crafting. We soon became good friends and you shared your love of exquisite dark chocolate - introducing me to Hotel Chocolat! I met Dawn in Amsterdam at a trade event. I remember clearly how nice she was with me and anyone else who speak to her. Soon after that she asked me to do some work for her and from then onwards we became close friends. I feel that Dawn is one of those few people who actually listens to what you say even if you do not think she does. It is a rare quality! You can read and hear a lot of things about Dawn Bibby. Not everything you read out there is true. An interesting first 'Craft Conversation' piece - shall look forward to reading more in the near future. Very interesting read, it was through watching Dawn that I got the crafting bug, not only paper crafting but knitting and crocheting too. in Westminster along time ago. Been a fan and admirer of Dawn since she first started on QVC! If it hadn't been for Dawn, my friend Julie and I would never have started cardmaking! We both knit and crochet and still make cards but agree that nobody likes paying for handmade items although you try and explain they are individual pieces!! Can't wait till September to see the next episode ! Love this piece, Dawn was my inspiration to start crafting. To read her journey along the crafting road is so interesting. I am looking forward to the next stage , she has been missed can't wait x. Really hope The Craft Channel (starting in Sept) and Dawn's next step are connected. With Anthony and Julian involved it would a natural progression?!? First time I have visited your blog- because I saw the name Dawn Bibby! She's the reason I got into papercrafts! Have bookmarked your blog and shall visit again. Great conversation piece Paula. I wonder if Dawn remembers me when I did a demonstration ages ago at Topaz crafts with Woodware products?